Simply put, most calculus textbooks are written in the wrong order. Unfortunately, this includes the most popular textbooks used in colleges and universities today. This problem has a long history, and will not be quickly solved for a variety of reasons. I think the solution lies ultimately with high quality, open source e-modules (that is, stand-alone tutorials on all calculus-related topics), but that discussion is for another time. Today, I want to address a more pressing issue: since many of us (including myself) must teach from such textbooks — now, long before the publishing revolution — how might we provide students a more engaging, productive calculus experience? To be specific, I’ll describe some strategies I’ve used in calculus over the past several years. Once you get the idea, you’ll be able to look through your syllabus and find ways to make similar adaptations. There are so many different versions of calculus taught, there is no “one size fits all” solution. So here goes. Students routinely ask, “When am I ever going to use this?” At one time, I dismissed the question as irrelevant — surely students should know that the learning process is not one of immediate gratification. But when I really understood what they were asking — “How do I make sense of what you’re telling me when I have nothing to relate it to except the promise of some unknown future problem?” — I started to rethink how I presented concepts in calculus. I also didn’t want to write my own calculus textbook from scratch — so I looked for ways to use the resources I already had. Simply doing the introductory section on differentiation before the chapter on limits takes no additional time in the classroom, and not much preparation on the part of the teacher. This point is crucial for the typical teacher — time is precious. What I’m advocating is just a reshuffling of the topics we (have to) teach anyway. 2. I no longer teach the chapter on techniques of integration as a “chapter.” In the typical textbook, nothing in this chapter is sufficiently motivated. So here’s what I do. I teach trigonometric substitution (hyperbolic as well — that for another blog post) when I cover arc length and surface area — again, since integrals involving square roots arise naturally here. In other words, the limits we often encounter while studying L’Hopital’s rule provide a good motivation for polynomial approximations. Once the idea is introduced, higher-order — eventually “infinite-order” — approximations can be brought in. Some algorithms approximate transcendental functions with polynomials — this provides food for thought as well. Natural questions arise: How far do we need to go to get a given desired accuracy? Will the process always work? I won’t say more about this approach here, since I’ve written up a complete set of Taylor series notes. They were written for an Honors-level class, so some sections won’t be appropriate for a typical calculus course. They were also intended for use in an inquiry-based learning environment, and so are not in the usual “text, examples, exercise” order. But I hope they at least convey an approach to the subject, which I have adapted to a more traditional university setting as well. For the interested instructor, I also have compiled a complete Solutions Manual. I think this is enough to give you the idea of my approach to using a traditional textbook. Every calculus teacher has their own way of thinking about the subject — as it should be. There is no reason to think that every teacher should teach calculus in the same way — but there is every reason to think that calculus teachers should be contemplating how to make this beautiful subject more accessible to their students. 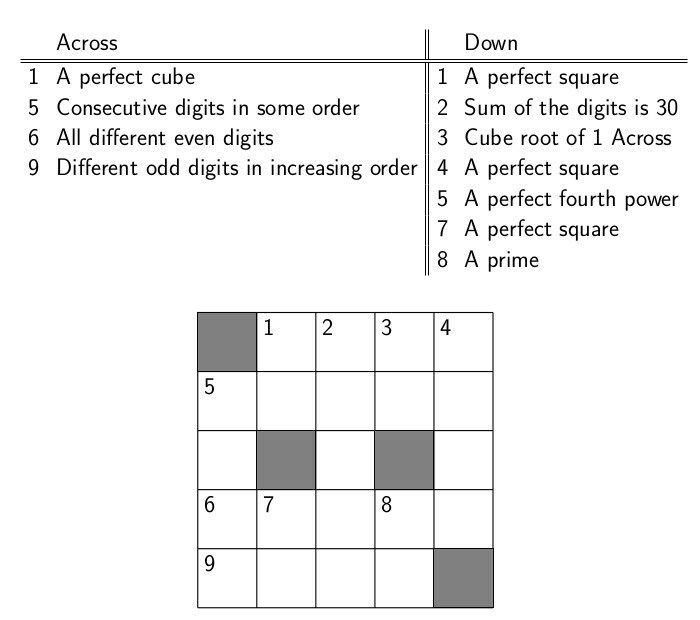 This week, we’ll look at one of my favorite types of puzzles — CrossNumber Puzzles. These are like crossword puzzles, except that the clues describe numbers instead of words. The only rule is that no entry in a CrossNumber Puzzle can start with a “0.” You can try this one — but don’t worry if you get stuck. We’ll look at different ways you can go about solving it in just a moment. You can see that the only possibility is that 1 Across is 4913 and 3 Down is 17. Looking at 5 Across doesn’t help much, since there are too many possibilities. So 5 Down must be either 2401 or 6561. If it were 2401, then 6 Across would begin with a “0,” so that leaves 6561 as the only option for 5 Down. I’ll leave it to you to complete the puzzle. I won’t post a solution so that you’re not tempted to peek — but if you add 2 Down and 6 Across when you’re done, you’ll get 157,991. My first post on art is about Josef Albers and his use of color. An idea central to his work is that we do not see “individual” colors — but colors are always perceived in relationship to the surrounding colors. Look at this image for a moment — what do you notice about the smaller rectangles? If you look carefully, you’ll notice that they are all the same color. 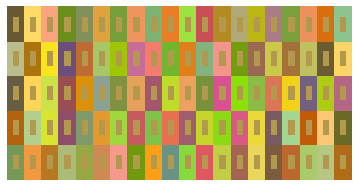 It may look like some are darker than others — but that’s only because you’re seeing them against different background colors. Albers explored this idea in depth in his famous book, Interaction of Color. So how can you create this image?  Begin with a color specified as RGB — in this case, (0.7,0.6,0.3) — to use as the color of the smaller rectangles. Remember that (0,0,0) is black and (1,1,1) is white; using values for R, G, and B between 0 and 1 will allow you to produce millions of different color combinations. Now use your computer’s random number generating ability to create three random numbers between -0.3 and 0.3. For this example, I’ll use -0.2, -0.1, and 0.3. 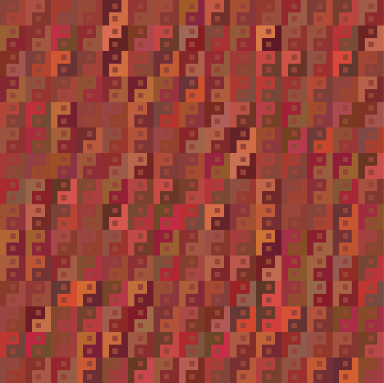 Subtract these values from (0.7,0.6,0.3) to get the RGB values for the left larger rectangle — you get (0.9,0.7,0.0). Then add these random numbers to (0.7,0.6,0.3) to get (0.5,0.5,0.6) — these are the RGB values for the right larger rectangle. Notice that this procedure assigns RGB values to the smaller rectangles which are the numerical averages of the RGB values of the colors of the surrounding rectangles. Keep in mind that this is an arithmetic mixing of colors. 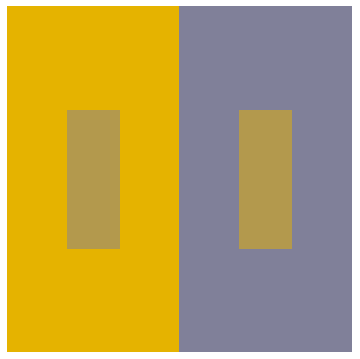 If you actually had paints which were the colors of the larger rectangles, mixing them would likely not give you the color of the smaller rectangles. Also keep in mind that Interaction of Color was published in 1963, so that Albers’ ideas were developed with paper and pigment. What I’ve done is adapted Albers’ ideas for use on a computer — and interpreted his ideas as you see here. Color theory is a very complex field, and is widely written about on the internet — so if these ideas intrigue you, start searching! As a final example, here is a piece incorporating these ideas about color with an abstract yin/yang motif. Visit my art website if you’d like to see some additional images with commentary. Now we’ll get to the specifics of actually implementing the ideas mentioned above. I’ve decided to use Python for these examples since it is a language growing in popularity and is open source. Also, I’m using Python in a Sage environment because it’s open source, too — and you don’t need to download or install anything. You can just open a Sage worksheet in your browser. Sometimes it’s a little slow, so be patient. You can download Sage onto your own computer if you’d like to speed things up. Here is the link to the interactive color demo. It’s fairly self-explanatory — and you don’t need to know any Python to use the sliders. Just hit shift+enter as explained in the instructions. One thing to be careful about, though. If you choose a red value of 0.8, and then choose to vary this value by 0.4 — you’ll get red values of 0.4 and 1.2. But since RGB values are between 0 and 1, the 1.2 is “truncated” to 1.0, so you’re really working with 0.4 and 1.0. This means that 0.8 is no longer the average of the two red values — so the “Albers” effect won’t be so pronounced, and may be absent if your values are too far off. Select your values carefully! I’ve tried to make the code fairly straightforward, so if you know a little about Python or programming in general, you should be able to make some of your own changes. You’ll have to make a Sage account and copy my code to one of your own projects in order to make changes. This blog is designed to give you ideas to think about, not be a tutorial. So I won’t be teaching you Python. If you need to understand the basics of the RGB color space — well, just look it up. There’s also plenty online about Josef Albers. Go in any direction you like. But if you are going to play with the Python code to make more complex images, here’s a suggestion. Whenever you are about to type in RGB values, pause for a moment and ask why you’re choosing those particular values. Use color deliberately. This will make all the difference in the world — and may well be the difference between making a digital image, and creating digital art. The difficulty is that the creative dimension of mathematics is a bit elusive. Give a child crayons and ask her to draw a picture, sure — but give a student some ideas and ask him to create a new one? To appreciate mathematical creativity, you need some understanding of the abstract nature of mathematics itself. To create mathematics, you need imagination much like you do in any of the arts — or other sciences, for that matter. This blog is about sharing some of my ideas, problems, and puzzles. Some were created years ago, some are new — and I will consider myself lucky if some are entirely original. I truly did have fun creating them, and I enjoy writing about them now. I’m hoping to convey an enthusiasm for mathematics and its related fields — in other words, all human knowledge — and to share something of the creative process as well. The creation of mathematics is not a mystical process, and needs no explanation to a mathematician. But we can surely do more to make this enlivening process accessible to all in a time when it is certainly necessary. As you follow, you’ll notice a heavy emphasis on programming. Every student should learn to program — and in more than one language. Perhaps this should be an axiom in the 21st century, but we’re not even close. So many of the tools I use are virtual — the ability to write code to perform various tasks is essential to my creative process, as you’ll see. In fact, many posts will have links to Python programs in the Sage platform (don’t worry if you don’t know what these are yet). These tools are all open source, and available to anyone with internet access. Finally, blog posts will usually have a “Continue reading…” section. Some posts (like this one) will be essays on teaching, creativity, or a related topic. Since not everyone may be so philosophically minded, the “Continue reading…” sections of these essays will be a puzzle or game. Enjoy! Continue reading What Is Mathematics? Posted on September 1, 2015 September 17, 2015 Categories Creativity, PedagogyTags Day001, Logic Puzzles1 Comment on What Is Mathematics?